There is this growing obsessions with the perfect backpack for techies and it has resulted in some clever new designs that go beyond what a typical backpack offers. After all, most conventional backpacks are not made for people who carry a battery pack, who want to charge their phone and tablet from their backpack, who carry a camera, often a tripod, a laptop and a bunch of messy cables all alongside their usual, everyday carry. Naturally, accommodating for all these cool gadgets in a backpack that remains convenient and useful as an everyday companion is no easy task. Luckily, there are more than one cool new backpacks that cater to this new type of city dweller: the techie. So with no further ado, here is our selection of some great backpacks that will make your travels much more enjoyable. Introduced last year, the OnePlus Travel Backpack has withstood the test of time and has proven to be one of the best value-for-money offers that combines convenience with a thoughtful and elegant design. It's a 20-liter backpack, meaning that it is about the average size of a backpack that you are used to see and carry: not too big, but not too small either. The OnePlus Travel Backpack has simple straight lines and has one superpower that many backpacks don't have: it can stand straight easily, regardless of what's inside it. This is possible thanks to the backpack's design and two dedicated "legs". It's made of an extremely durable Cordura material, proven to be more prone to wear-and-tear than nylon and you can check out various videos online where Cordura survives extreme torture. 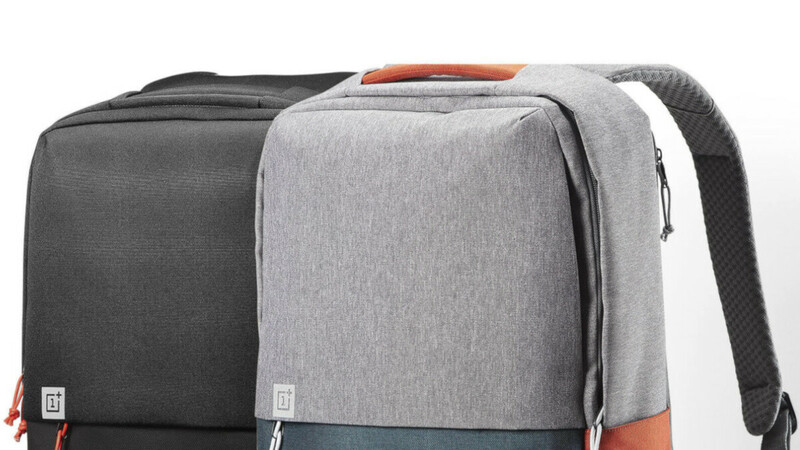 You get two color versions of the OnePlus travel backpack, a black one and a combination of gray and red, and both of them have their appeal. So what's inside the backpack? You have one big pocket in the middle (the only downside to this bag is that sometimes it's hard to move the zippers around the sharp edges, you fix this by slightly pushing on the bag and leveling the edge). Inside it, is a separate, deep pocket for a tablet of up to 10", another deep zipped pocket up front and a few other smaller pockets, perfect for things like cables, external drives, batteries and so on. You have a separate laptop compartment with a separate side access which makes it a breeze to take out your laptop at airports. And the bag also has a concealed tiny pocket where you can place things like your wallet, phone and others. The cons for this bag is the lack of any storage for a dedicated camera or a tripod, but for your general tech user, this is a great solution at a very reasonable price and one that is very comfortable to carry with very nice padding. Errant's new backpack is on Kickstarter at the moment of this writing and you can secure yours (shipping in October 2018) for $100, but it is so well thought out and functional that it is worth talking about it before the launch. First of all, the Errant is a 24L bag with a clamshell style opening and compartments for everything, including a tripod and camera. It features modular components that you can arrange inside the bag to get the layout that best suits you, whether you are a techie slash photographer, adventurer, frequent traveler or just a commuter. Keep in mind, though, that if you want the extra modules for camera and other types of storage, the price of the backpack climbs to $200 and even up. The material of the Errant backpack is a highly durable nylon and it features plenty of padding on the back and shoulder pads. On the bottom, you have an expandable shoe compartment that is practically invisible when you are not using it. Once you open the big compartment, you find a nice zipped storage at the top where you can drop your headphones, secure items and cords, while up front you have separate compartments for up to a 17" laptop and a big tablet. Two mesh pockets at the front are also perfect places to store your cables, chargers, hard disk drives and other smaller gadgets. On the side, you have a quick access pocket, perfect for your phone, and if you are into hiking you'd appreciate seeing that the bag has a hydration hose integration. You also have a side pocket for a tripod with an expandable tripod strap to keep it in place. Then you have the modules: the CB-1 camera compartment costs extra but is basically a camera bag on its own that it tailor-made to fit inside the Errant backpack. It easily houses a camera body and a couple of lenses. The MK-2 photo case is even bigger, with enough space to fit your drone. Overall, the Errant is another versatile backpack solution that you might want to consider. The big name in the tech backpack game in the past couple of years has surely been Peak Design. The company has produced some impressive backpacks that are selling well despite their high price. The Peak Design Everyday Backpack comes in a 20L and 30L versions, with prices of around $260 and $300, and it has alien looks, but most importantly a ton of customization options and functionality. This backpack is the perfect solution for camera geeks as it easily holds a full-sized DSLR with 3 to 4 different lenses, and provides easy, slingshot access to the lenses. The Peak Design backpack also comes with a cool magnetic closure system that is quiet and extremely easy to use. The bag also comes with clever pockets built in the side panels where you have meshed compartments, perfect for all sorts of cables, chargers, and other smaller accessories. On the back, you have very well designed straps that hug you and make an even bigger load feel less tiring on the shoulders. And of course, you have a dedicated space for a tripod. If you can live with the high price, the Peak bag is probably your best option if you are a photography geek. Last, but not least, is this bag on Amazon that has a weird name that nobody will remember, yet that is very well crafted and offers lots of versatile storage for the exorbitant price of... $26! Yes, it's ten times cheaper than the Peak Design bag! Here is what this bag is all about: an understated, elegant look with various color options, a separate laptop compartment fitting sizes of up to 15.6 inches, as well as dedicated pockets for a phone, a tablet and more. There is also a USB and headset port with a built-in cable design that makes it easier to charge your phone on the go. And the bag comes with a lifetime warrany and 24/7 service. No buy-it here link for the last two? IMHO Travelpro and Everki make the best business backpacks. I have had the Travelpro Executive Choice 2 and Everki Versa and they are both wonderful.